CARLSBAD — Carlsbad City Council members voted to remove a public art piece at the Dove Library. The granite boulder entitled, “Who, What, Why, How,” by Ellen Ziegler is slated for removal in the outdoor courtyard area. The piece has been displayed for the past 14 years. A combination of erosion, a nonworking water feature and a potential hazard to children who play on it were some of the reasons behind city’s decision. To date, no injuries have been filed. The conclusion for deaccession allows the city to decide on whether or not to sell, relocate, or trade the artwork. The cost to remove the 13-ton stone boulder is estimated at $8,800. 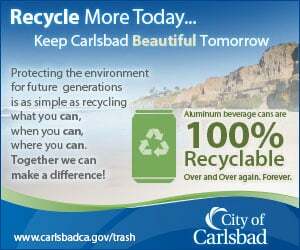 Carlsbad resident, Bob Wilkinson, spoke to the city council hoping they would reconsider their decision. Wilkinson went on to say that he believed the artwork was in perfect sync with the building’s design and landscape. He also pointed out that he thought that their public artwork longevity should be longer than 14 years, referring to Ziegler’s piece. “Especially one that is made up of a natural slab of stone,” he said, adding how it should last as long as the building. Wilkinson called the Dove Library a premiere cultural facility and was worried that if the sculpture was removed, there would be an artistic void in the courtyard. The City purchased the piece for $62,500. If it stayed, staff reported the estimated cost for repairs and restorations at around $19,000 with an additional annual maintenance price tag of $1,500. Mayor Pro Tem Ann Kulchin said that she was involved with the Dove Library prior to 1998. She was its city council representative and on various committees. She agreed with staff that there was a liability issue with the artwork in regard to children climbing and playing on it. “It’s just not safe anymore,” said Kulchin, noting how staff did a good job researching the item. She told Wilkinson that they would not remove it and not put something in its place. Kulchin said that since the library was also used as a meeting center that an option for a seating area would also be considered. Library and Cultural Arts Director for the Carlsbad City Library Heather Pizzuto was on hand to offer more information to city council. She said that its process to conduct the possible deaccession of this artwork included a combination of its Arts Commission and Acquisition Committee, which represented the public. Pizzuto said this also included reflecting how it would affect the other meeting facilities adjacent to the courtyard. She pointed out that the library still houses several other art items. “We do have a strong representation of public art at this point,” Pizzuto said.